“The Bank of England may be pleased to see inflation ease below its 2.0% target in January, as this may give them breathing space in which to calibrate monetary policy in the run-up to and initial stages of Brexit, but retailers may also welcome a lesser increase in the cost of living,” says Russ Mould, AJ Bell Investment Director. “Wage growth is finally outpacing inflation and this puts more cash in consumers’ pockets. “How they choose to spend the extra cash remains an open question. Do they pay down debt? Save it? Spend it? And if they spend it, do they spend it on experiences and or on shopping for stuff? And if they shop, do they do it online or on the High Street? 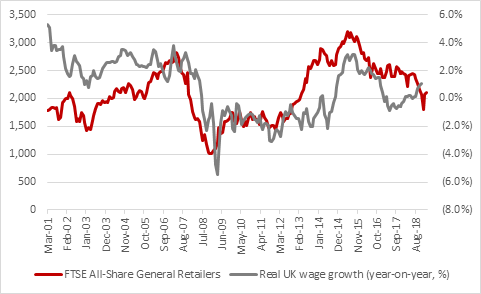 “But, traditionally, good wage growth in real, post-inflation, terms, has tended to be good news for retail stocks – though we must always remember that the past is not necessarily a good guide to the future, especially given the seemingly unequal nature of the fight between online and physical retailers. 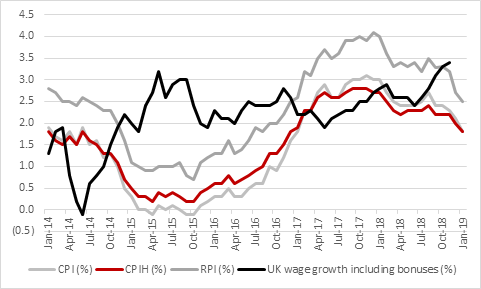 “Investors with exposure to retailers – whether they are brick-and-mortar based, multi-channel or purely online – will now be looking to ahead to next Tuesday’s unemployment and wage growth numbers. “The last numbers, for the three months to November, showed a jobless rate of 4%, the lowest level since 1974, and an employment rate of 75.6%, the highest level since records began in 1971.